Nonmetropolitan counties saw an increase in population over the last year -- the first such gain since 2011. The increase was slight and confined to rural counties that are closest to cities, according to a report from the UNH Carsey School of Public Policy. Rural American counties reversed a six-year trend of population decline in 2017, but the increase was slight and confined to the counties closest to metropolitan areas, according to new Census data. Nonmetropolitan counties gained 33,000 residents (or 0.1 percent) from July 2016 to July 2017, according to a report by Kenneth M. Johnson, senior demographer at the University of New Hampshire’s Carsey School of Public Policy. The gain is small but could signal a return to migration patterns that were disrupted by the Great Recession of 2008, Johnson says. The renewed growth was fueled by renewed domestic in-migration to rural counties near metropolitan areas. Historically, these rural counties grew considerably faster than more remote rural counties because metropolitan sprawl spilled over into them. The Great Recession reversed this long-term trend and for several years these adjacent counties lost more population than remote rural counties. Between July of 2016 and July of 2017, [rural counties adjacent to metropolitan counties] gained 57,000 residents because a domestic migration gain supplemented immigration, and natural increase. In contrast, rural counties that were not near metropolitan areas continued to lose population due to sustained domestic migration loss. The fastest growing rural counties have recreational and scenic amenities and many also appeal to retirees. Such counties have traditionally attracted domestic migrants, but such migration sharply diminished during the Great Recession. Migrants are again coming to these recreational and retirement areas. The domestic migration gain here last year was three times as large as it was three years ago. Farm counties continued to experience domestic outmigration and population loss last year, but the loss was less than in previous years. During the recession, rural manufacturing counties lost population because of a significant domestic migration loss. Last year, rural manufacturing counties experienced a small population gain, in part because domestic migration loss diminished. While migration may be returning to pre-recession patterns, population change from births and deaths is still at historic lows. Nationally, there were about 1.23 million more births than deaths last year. That figure is the lowest it has been in 35 years, Johnson reports. Natural decrease (more deaths than births) is occurring in 45 percent of the nation’s rural counties and 24 percent of urban counties. This year, deaths exceeded births in two entire states: more people died than were born in both Maine and West Virginia. 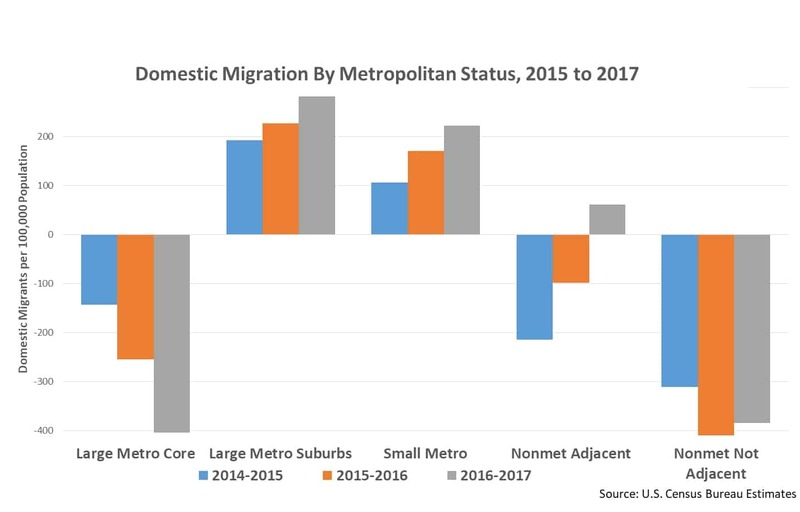 The suburbs of major cities and counties in small metropolitan areas saw a net increase in population from migration, while core counties of major metros saw a net loss in migration. This is also a return to pre-recession population change patterns, Johnson said. How this story defines rural: This story uses the Office of Management and Budget metropolitan statistical area system to define rural. Rural counties are defined as those that are not in a metropolitan statistical area or MSA. In this story, rural is synonymous with nonmetropolitan. There are numerous ways to define rural. You can learn more (much more!) from the USDA Economic Research Research and the U.S. Census.